If you haven’t already finished your Thanksgiving shopping, waiting for great deals might be high on your list. With all the possible choices and places to shop, it may be confusing and difficult to decide where to find the best deals. Be sure to take along our Printable Thanksgiving Shopping List (PDF) to ensure you don’t forget anything. What Is the Cost of Thanksgiving Dinner? The good news is there hasn’t been a large increase in the price of a traditional Thanksgiving meal. According to the American Farm Bureau’s 32nd Price Survey, you can prepare a traditional Thanksgiving dinner serving 10 people for just $50, and for the most part is the same as compared to last year. The survey found that the average price for a Thanksgiving feast in 2017 is $49.12 which comes out to less than $5 a person. There are a number of ways to save money on Thanksgiving. So, how would one score an excellent price on a Thanksgiving feast? Meijer offers a turkey at $0.37 per lb (limit one per transaction) which is a great deal and among the lowest available. This year, there is no spending requirement for the turkey deal, unless you live in Wisconsin, where you’ll need to purchase $25 worth of groceries. Kroger offers turkeys at $0.47 per lb (limit two) with an additional $25 in purchases. Essentially, all major chains are selling turkeys at a loss. Why? Because the turkeys get discounted only if you purchase more merchandise from the store. Vegetables are down in price too, with Aldi leading the country in the lowest priced vegetables overall. Although you may not find as much local produce as most people prefer these days, you should still consider Walmart when you shop. They offer low prices on Libbys and Double Lucky brand canned vegetables, and their prices on fresh vegetables are nothing to scoff at. In recent years internet retailers have made a bigger push for holiday-related food sales. Companies like Amazon , Netgrocer, Shopfoodex, and MyBrands are all offering seasonal discounts on fall food orders, so you might be able to get some good deals on bulk non-perishable items. Of these retailers, Amazon is the 800-pound gorilla. Its got the biggest selection of organic and hard to find foods. You can also get free shipping if you sign up for a free trial of Amazon Prime. There is a bit more work involved, but you can sign up for the trial, buy your stuff, then cancel to avoid the shipping fees. You may have to purchase a little more to get your turkey at a discount, which could increase the overall cost of your meal. Be sure to weigh the pros and cons of spending enough on groceries with the regular cost of the turkey. What’s on your Thanksgiving shopping list? Share with us in the comments below! Fall is finally here! That means it is time for cooler weather, comfy clothes and, of course, some of the best comfort foods. Not everyone has the time to cook homemade meals each day though, which is where cheap freezer meals come in. Make them ahead of time, place them in the freezer and just reheat. So, what are some cheap freezer meals you can try? Below are five cheap freezer meals for you to try. Each offers a delicious, home-cooked meal that is freezable so you can make it ahead of time and they’re extremely cheap. Chicken tacos are a great “hands off” meal. Simply dice chicken breast and place it in a freezer-safe Ziploc bag with the hot sauce of your choice. Depending on how easy you’d like your meals to be, you can either freeze the chicken tacos like this and prepare them on a separate night. Or, instead, you can make the chicken that day (just chicken breast, hot sauce, salt and pepper). Then, wrap the chicken in tortillas with cheese and place the well-wrapped tortilla in the freezer in a freezer-safe Ziploc bag. When you’re ready to eat them, microwave for 2 minutes on high (or until heated through). This meal only costs about $2.50 per serving and can save you a ton of time during a busy week. Lasagna is something that many people buy frozen, however, you can save a bit of money if you make it ahead of time and freeze it yourself. You’ll need 18 lasagna noodle, 3 pounds ground beef, 3 jars (26 oz) spaghetti sauce, 2 large eggs, 1-1/2 pounds ricotta cheese, 6 cups shredded part-skim mozzarella cheese, dried parsley flakes, salt, pepper and Parmesan cheese. You’ll want to cook the meat and noodles first then begin layering the lasagna in a freezer-safe pan (you can get these at the Dollar Store). All in all, it makes 24 servings with not a lot of effort or cash. This costs about $1.50 per serving. Breakfast sandwiches are one of the easiest things to make and throw in the freezer for quick mornings. All you need is a package of English muffins, eggs, bacon or sausage, cheese, salt and pepper. To prepare these, cook the meat first and set aside. Cook the eggs in the grease leftover (scrambled freezes best). Put the eggs directly on the English muffin, then cheese, meat and the top half of the muffin. Place in a small freezer-safe bag or vacuum seal it (if you have the capability). When you’re ready to enjoy your breakfast, place it on a microwave-safe plate and place a paper towel on top of it. Microwave on high for 2 minutes or until heated through. These breakfast sandwiches cost just over $2 per serving. Freezer meals are a great way to save both time and money, as you can see above. If you’ve got a fun, cheap freezer meal you’d like to share, let us know! You can also check out great, cheap recipes in the Saving Advice forums. The conventional wisdom is that we are a nation which is overweight because we’re too lazy to get enough exercise, and we don’t eat enough healthy food. A new study says that these assumptions are wrong. 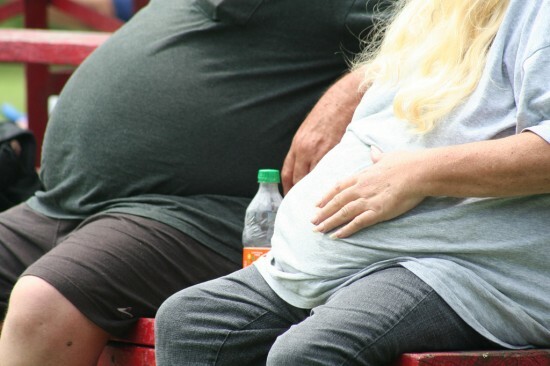 The real problem causing American’s expanding waistline isn’t the lack of exercise or not eating fruits and vegetables, but it’s due to the fact that food is too inexpensive. A recent study by Roland Sturm and Ruopeng An argue that the key element behind Americans getting heavier is the fact that food is too cheap. The two reviewed government data over several decades to see how much Americans spent on food. They found that Americans currently spend less than 10% of their disposable income on food, yet with that 10%, they are able to buy more food than families in previous decades (The percentage does vary depending on income group. The poorest 20% of Americans spend far more on food — close to 33% of their disposable income). In the 1950’s American families spent 20% of their income on food, and families in the 1930’s spent 25% of their income on food. The study found Americans are able to spend a smaller percentage of their income on food than families in any other nation in the world, and they still get more food for that amount. While one of the main factors is that food is less expensive, the effect is compounded by the fact that it’s much easier to buy and prepare food today than it was in past decades. The result of being able to purchase a wider variety of easily prepared cheap food results in Americans increasing their caloric intake. According to the Department of Agriculture, the average American consumed 2,109 calories in 1970. In 2010, that amount had risen to 2,568 calories. In other words, an American today eats the equivalent of an extra McDonald’s double cheeseburger every day, 365 days a year, than he did 35 years ago. Another part the problem is that we are able to eat a lot faster than we have in the past. Far more people choose to go for quantity over quality today. It’s a lot easier and less time consuming to buy food at a restaurant, or to pick up premade meals, than to prepare an entire meal from scratch. Since Americans have such easy access to ready-made foods which don’t cost a lot, it’s much easier for them to consume greater amounts of calories without breaking their budget. This leads to some surprising findings. Since Americans have access to a wider variety of foods, studies have found they are eating more fresh produce and getting more exercise, but they are still getting fatter. The authors conclude the standard advice to lose weight by getting more exercise and eating more produce won’t solve the problem by itself. Americans are already doing that. Unfortunately, they’re also consuming more food while doing it. For those who really want to lose weight, there needs to be a lifestyle change rather than simply an addition of more exercise and eating more of certain foods. When it comes to ways to save on food bills, there are sales, coupons, meal planning, loyalty cards, and eating leftovers. You can also stop eating out and brown bag your lunches. But the best (and least used) way to save money on food is to simply eat less. Why is this strange? Because no one seems to think of it. People complain that their food costs are out of control and they go crazy trying to find ways to cut the grocery bill. Yet the fastest and easiest way to cut the bill is to stop eating so much. In this country this is truly a strange idea for most people. Food is so plentiful and relatively cheap that we eat way too much of it. Portion sizes are outrageous, too, with restaurants routinely serving two to three times the recommended serving sizes. And no matter where we go, we’re surrounded by food. It’s the centerpiece of most social gatherings, it’s at every cash register (even in stores that have nothing to do with food), and there are shops and cafes on almost every corner. Food is so easy to get in the US that we forget that it’s not this way in many other countries. In many places, eating less isn’t a matter of saving money, it’s just the way things are. The easiest way to eat less is to pare down your portions. If you’re in a restaurant, eat only half or even a third of what is served. Take the rest home and eat it the next day. You’ll get two or three meals for the price of one. Or, you can order from the kid’s menu which offers much smaller portions and smaller prices. At fast food places, don’t get the combo. Just get the sandwich and a drink. At home, if you make a dish that you normally cut into four servings, try cutting it into six or eight. See if you can get more meals out of one dish. Eat half a sandwich or bagel instead of the whole thing. This will stretch a loaf of bread or bag of bagels twice as far. If you usually eat a whole bag of popcorn with your Saturday DVD rental, try eating half the bag. Experiment with your meals and snacks to see if you can cut your portions down. You might not miss the extra as much as you think you will. Beyond watching your portions, you can eliminate certain foods from your diet altogether. If you’re used to eating a sandwich, chips, and cookies for lunch, try eating just the sandwich and some carrots. Drop soda in favor of water. Dropping soda alone will trim your food bill substantially. If you put cheese on your sandwich every day, try using cheese only twice a week or not at all. If you usually serve three side items at every dinner, try serving two. Or drop the rolls/biscuits. Look at what you put into each meal to see if you can eliminate it or reduce it. Finally, you can try to use less of certain ingredients to stretch your food dollars. If a recipe calls for a cup of cheese, see if you can make do with half a cup. If you’re supposed to use a pound of ground beef in a casserole, see if half a pound will do. Can you substitute something else that’s less expensive like adding in an extra vegetable? If you use less of an ingredient for one meal, you’ll be able to get another meal out of the left over ingredients. There are a couple of other tricks that can make eating less easier to take. Put your food on smaller plates. This visual trick makes it look like you’re eating more than you are. Eat slowly so that the full signal has time to reach your brain. When you pound the food down too fast, your brain doesn’t register fullness until you’re way past that point. When you’re at a restaurant, ask for a takeout box as soon as the food comes and immediately put half or 2/3 in the box. If you can’t see it, you’ll be less tempted to eat it. Eating less has many benefits besides saving money on just food. Studies show that 68% of the American population is overweight or obese. Eating less would do most of us some good. The healthier you are, the lower your insurance and health care costs. If you lose weight, you’ll lighten the load in your car and save on gas. You might have more energy to get things done. At the very least, you’ll cut that food bill down without having to spend time clipping coupons and tracking sales. She went on to explain that if they eat off the value and kids’ menus, they can get a meal for as little as ten dollars, or just a little more than $3 per person. “I can’t make a meal for three people at home for that little,” she said. I begged to differ and I told her so. Certainly, if all you ever buy in the grocery store is the pre-made, boxed convenience foods, your grocery bill is going to be very high. However, if you learn to make some simple meals from basic ingredients, you can eat healthy and inexpensively. Off the top of my head, I listed three easy (and healthy) meals that can be made for much less than $3 per serving. Lasagna made with vegetarian meat crumbles and whole wheat noodles: The ingredients for my recipe cost about $14 if you buy without coupons or sales. The recipe serves eight people, so it works out to $1.75 per serving. If I can get the ingredients on sale or with coupons, I can make it even cheaper. Mexican “pizza pie” with wheat tortillas, black beans, vegetarian meat crumbles, peppers, and salsa: The ingredients for this are about $13 retail. The recipe serves six, and there is always some left over tortillas, beans, salsa and meat that can be used for tacos for lunch. It works out to $2.16 per serving, plus you can get another lunch or two out of the deal with the leftover ingredients. Chicken wraps and vegetables: I make this with whole wheat tortillas, frozen chicken strips, peppers, onions, black olives, and brown rice. For the side dishes, I serve two vegetables, choosing from whatever’s in season. Generally the ingredients for this cost about $12 and I can make eight wraps from the recipe. That works out to $1.50 per serving. Obviously your prices will be different, depending on where you live and what kind of stores you have nearby. Also, the more aggressive you are with sales and coupons the lower your costs will be. But the point is that you can make some easy meals for much less per serving than fast food. There is a perception that healthy food costs more and that the average family has to eat fast food or processed food in order to stay within budget. This simply isn’t true. While you may have to learn some new recipes or new ways to shop, it is entirely possible to eat at home (and eat well) for less than the cost of dining out. There are plenty of healthier choices out there in the form of canned or frozen veggies (choose the lower sodium and no sauce varieties), produce bought at farmer’s markets, meatless meals, and meat or produce bought (and used) close to their sell by dates. Even homemade versions of favorites like pizza and macaroni and cheese are likely to be cheaper and healthier than their restaurant counterparts. And if the prices listed above don’t sway you to eat at home more often, think about this: Even if you think you’re eating cheaply today, you will pay for it later. When your eating habits lead to problems like obesity, diabetes, cancer, vitamin deficiencies, and other health problems, your health care costs will skyrocket. The amount you’ll pay to fix your health problems will quickly outstrip any “savings” you got from eating fast food. The long term costs of eating out all the time can be significant. My friend and her family are heading toward this point, now. All of them have some health problems and, while not all of them might have been caused by diet, their diets aren’t helping the situation. When I told her how cheaply they could eat at home, she was astonished. She had never really bought anything other than the pre-made, processed foods in the store, so she really believed that grocery store food cost more than eating out. I took her shopping and gave her an education. I also opened up my recipe file to her and she now has a set of quick and healthy meals to make at home. They are eating out much less often, are saving money, and are working toward better health.